As has been nationally reported, two cyclists were killed in Hanham on Sunday afternoon. The driver of the car has turned themselves in. The thoughts and condolences of most Bristolians, whether they cycle or not, will be with the friends and families of the deceased. Bristol is a much smaller town than London; you end up recognising and becoming acquainted with many people, just because you pass them and meet them more often. For that reason, its possible that one of the regular Bristol Traffic submitters may know of them -or know someone who does. Right now: uncertainty; the only news anyone has are the snippets that come out on the press. On that topic, the Evening Post has shown the decency to turn off comments in their coverage of the tragedy. Having idiots post comments about helmets is not appropriate or welcome. For those people outside the city who don't know Hanham, well, it's unappealling to cycle through. Kingswood has long had a tradition of being outside Bristol; Hanham similar -and it's not far from St George -one of whose resident's was convicted last year of a "moment of madness" road rage attack on a cyclist. That's not representative of the area; another way to view it is as "a part of the city that is not yet a cycling city". The A431 may be a more direct route from Bitton to the city centre, but the Railway Path is preferred by cycle. Even there, the Kingswood stretch is the one where you are most likely to encounter a teenager on a motorbike. There's no reason to speculate on the killing itself, except we will use that term: killing. Someone made some decisions on Sunday that resulted in the death of two people. Assuming it was the driver who drove off after the crash who made those decisions, the track record of the UK legal system's ability to deliver justice in death-by-car killings is very awful. Sometimes the penalty can be less expensive than a parking ticket. We've seen the Avon and Somerset police to be supportive of cyclists in the past, what we shall wait to see is if the CPS and judiciary are also supportive. Certainly we don't think that any crime that results in death -even if is "just" a car accident - should be handled by a magistrate alone. In the meantime, we extend our condolences to those who knew the deceased. Further down ninetree hill, there's a red clio SN52BNJ paveparked quite elegantly. It's only when you get alongside that it's clear that this car wasn't parked -it crashed into a lamp post while sliding backwards down the hill -presumably with all occupants screaming in terror trying to wheelspin their way out of trouble. It must have been frightening -we hope they are all right. Even so, as you look up the 1 in 4 hill, seeing more than one vehicle crashed on it, some thoughts spring to mind. What made the drivers think going up here was a good idea? You can't into kingsdown by car all that is left is the parking on Dove Street. On a day like friday, all parking restrictions are cancelled.There's no reason to park on Dove St. The streets were covered in snow and ice, and vehicles couldn't get up less steep roads -some of the main Kingsdown access routes were blocked off, and we saw Cotham Hill earlier -that's a 5-10% gradient maximum. If you do get to the top of Dove St to park, you'll have to come down this or the other hill-option later -and again, that could be icy. If your attempt fails, you aren't going to just get stuck. You will slide down backwards until you hit something. If this hill was a secret rat-run, we could see why someone would want to go up there. But it isn't -and these photos show why you should avoid it after snow unless you have a sledge. Every year, when it snows, the same thing happens. Someone tries to drive up or down ninetree hill, gets in trouble, crashes. Every single time -sometimes people even die. It's as repetitive as the letters that appear in the Daily Mail the same week "how can they claim there's global warming when it snowed?". We suspect the writers and the drivers may be related. This weekend there's a white van wedged halfway up the street. That's the street with the 20-25% gradient, something they should have noticed on the way up. Presumably they noticed it on the way down, as it slid backwards into the stone wall of one of the houses. With the rear in the garden, it may be safe -but as no breakdown van is going to come and retrieve it for days, there's the risk that it may start sliding down the hill again. Hence the mooring. Somone has wrapped some nylon tape round one of the bollards on Springfield Road, and clipped it to one of the wheels. That may be enough. For the curious, the van has "A shade greener" on it -this is a company that provides free solar panels to your roof in exchange for getting the feed in tariff back. It seems unlikely that the day where Bristol has had its heaviest snow for at least two years was a priority day for installing solar panels -let alone trying to drive up ninetree hill. We would love to see the correspondence with the insurers on this one. Someone has scraped "Doh" in the ice on the windscreen of FG61NXZ. We concur. 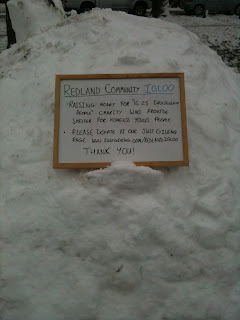 We've been up to Redland, checking out that our roads have been properly gritted. Remember, people, we pay for the roads, so you can grit them. Imagine our surprise, therefore, when we found an Igloo, no moving cars, and a place full of community spirit. There were snowmen, of course, but the Igloo caught our attention, as it doesn't have planning permission. Seasoned readers of this blog will appreciate that we can't stand law-breakers, although we're sure the police will be onto them as a crew from HTV West are reported to have turned up to film the miscreants that created the object. A group of students (unwashed, probably) built it, and one apparently had the audacity to actually sleep in the Igloo last night to promote the plight of the homeless young in Bristol. Quite why people should get involved with this sort of thing is beyond us. Surely their time would have been better spent gritting our roads? The upstanding residents of Woodland Road, next to the Igloo, have their priorities much more clearly focused, using the local grit bin to proper effect, ensuring they have direct access to Bristol's road network no matter what the weather. A lot people are still driving their small cars to school and work, creating needless traffic jams for important people. Here on Whiteladies road you can see this. This traffic jam is making it hard for us to complete our Clifton school runs -and so feel smug about spending an extra £1500 on a vehicle with awful fuel economy. They are also hard to park -which is why Clifton so desperately needs more parking. This morning you can see that pedestrians who ignored our advice to stay at home are holding a 2WD up Whiteladies Gate, slowing down a Landrover. At the top of Cotham Hill, we can see more 2WD cars in trouble -with a pedestrian making it harder to clear the junction, so endangering themselves as these vehicles struggle to get through. Please can all drivers leave the round-town runabouts at home and get the big cars out today -you know you deserve it. they won't be cycling -they'll be walking -and in doing so, selfishly, making traffic worse. It's not safe and you know it -why else would you be cycling. The cyclist above is not only endangering themselves, they are still trying to get their son to school -a child who is being endangered by being forced to walk in the road. Pedestrians -please stay at home! The conditions are so bad that many of these people are walking in the road. This includes all the students trying to get to their lectures -when they could be indoors talking about snow on facebook or twitter. Please can everyone trying to walk round the city, think "is this journey really necessary". If not, don't go out. If you must go out -do not walk in the road, where you may hold up a 4x4, such as this landrover in Clifton -someone important trying to get their child to school before driving over to Clifton Village to help the local economy in a cafe. We had hoped that it being the last day to get comments in to the Clifton Expanded Parking Zone proposal, there'd be nobody else complaining about it. No, instead we get a copy of yet another objection -this one making the fallacious claim that the #8/#9 bus service is any good (he says "best in the city", which is a lower standard, but nothing meanders like the #8 -except if you get on the #9 going in the opposite direction from where you intended). Please write in with your support for the plan, else these objections may be listened to! I'm writing to object to aspects of the proposed TROs in Clifton, not in specific terms, but in general regarding the overall approach. The traffic orders appear to have been drawn up without any interaction between the highways and urban design departments, reinforcing the appearance of 'silo' attitudes within separate council departments. Surely, as a cycling city, we should actively encourage forms of transport other than the private car as a de facto standard across the entire city, and have a 'joined-up' approach to anything which affects the public realm? Clifton is well served by public transport (with arguably the best bus service in the city, complete with free wi-fi on most buses). Sadly, many people feel that the car is a better alternative. Allowing more parking will only reinforce this impression, and undermine more sustainable forms of transport. The area is currently badly served for cyclists, with little secure bike parking, which the TRO does nothing to address. The motor vehicle dominated one-way system does nothing for cycle permeability, and the proposed changes to the parking provision will prevent any future contraflow cycling lanes. The dominance of cars (many just circling round trying to find a parking space), makes the pedestrian experience of using the village particularly unpleasant in what should be a jewel in Bristol's urban landscape. The Boyce's Avenue experiment has been a success, so rather than seeking to find additional parking paces for cars why not be radical and consider extending the scheme to the eastern part of Princess Victoria Street, The Mall and Waterloo Street. This would bring a much needed car-free environment to central Clifton for much of the day, allowing traders to use the pavements, bringing vibrancy and vitality to the area. The 'Village' would then become a village once again, at least between, say, 09:00 and 18:00 every day. This proposal would cost little to implement initially, but in the longer term could be extended to full pedestrianisation of these streets. Outside the village, I have no strong feeling about the proposals, although I welcome the proposed changes to Worcester Road and Pembroke Vale as these seem more logical than the current arrangement. Well, it's predictable that the cycling campaign group would write in and object -which is why the council wisely announced this TRO in the most discreet way possible.Well, the tax-dodgers found out -but what you do expect from a group of unemployed people who have nothing better to do but go around the city at 5mph. Today, Jan 15 is the last day to write in supporting the Clifton Expanded Parking Zone proposal. We have prepared sample letters.for people to do this. The more people who write in -the better! The Bristol Cycling Campaign is a campaign group focused on making cycling safer and more popular within the city. We have many members, including those within the BS8 postcode. We have been strongly supportive of the Cycling City programme - and ongoing work to develop a cycling culture in Bristol. It has focused not just on making commuting by bicycle better - it has also worked to encourage cycling to the local shops and schools. These short journeys when made by car constitute a significant amount of congestion and pollution within the city - yet are some of the easiest to switch to cycling due to their short distance. With the recent announcements that "obesity is a new epidemic", and that exercise is the key to preventing this, encouraging walking and cycling is a key way to integrate exercise into the daily schedule of the population. Again, the Cycling City programme placed effort into this - and again, cycling and walking to the local shops was a key part of this. Examples of the actions here include the provisioning of large quantities of cycle parking in the shopping streets, including Gloucester Road, Stokes Croft, Cotham Hill/Clifton Down shopping centre, and Southville. These have helped encourage cycle traffic, and have helped keep these streets vibrant and popular. If there is one part of the inner-ring of shopping zones that has become a backwater to cycling, it is Clifton Village. A few cycle racks have reluctantly been placed around the outskirts of the village - yet the core area is, apart from a small rack on the Mall, entirely given over to car parking. Illegal parking is commonplace, while Caledonia Place suffers from continious double parking. The sole cycle park on Princess Victoria Street was at Clifton library, yet for reasons not fully explained, the secure "sheffield" racks have been replaced with four "wheel" racks that do nothing but ensure that when your bicycle is stolen, a wheel will remain. As a result of this inadequate cycle parking, Clifton is a black hole to bicycles. This is despite the fact that the Suspension Bridge is incredibly popular with cycling traffic, both locals and visitors. The failure of Clifton to accomodate the needs of this traffic must have a tangible impact on the revenue of the area - something that appears to have missed the attention of the shops and the councillors. Having reviewed CAE/NMT/P/815, we are supportive of the proposals to slightly increase the no-parking areas at the corners of junctions, as they improve visibility and so cycling safety. They also make ingress and egress easier, as it is easier to get past traffic coming in the opposite direction. We also support the proposed addition of more Car Club parking bays, as they encourage the use of pay-per-hour driving rather than owning a car. Even if the car club bays merely reduce the ownership of second cars, or discourage students from bringing their cars to the area - they will have a tangible affect in reducing the number of cars parked in the area. We are, however, utterly opposed to the proposed parking changes on Princess Victoria Street. These changes will make cycling through the village harder and more dangerous - while completely failing to do anything to make shopping in the village by bicycle viable. This proposal, therefore, violates the "hierarchy of provision" which the council has adopted as one of its core city planning philosophies. It runs counter to the Cycling City vision, and is intended to encourage driving to the shops. Yet the assumption that this will help retail sales is presented unquestioningly - though such a statement is indefensible without valid data. The 2006 study of Gloucester Road conducted by Bristol City Council and Sustrans showed that shops overestimated the number of customers driving to their shops. The estimates of customer transport options were: car 41%, bus 11%, bicycle 6% and foot 42%. The actual numbers were: car 22%, bus 13%, bicycle 10% and foot 55%. The fact that shops in a nearby Bristol street estimated car use as a majority transport option, rather than a minority activity shows that retailers concerns about the lack of parking can be over 100% out - and that they should be effectively discounted. Assuming the figures from Gloucester Road apply to Clifton - albeit with less bus traffic - then the focus of transport provisioning should be on pedestrians, with cycling, as 1/4 of the traffic of cars, awarded at least 25% of the parking capacity in the area as that provided for cars. The Clifton TRO does not do this. Instead it actually proposes to remove a not-yet-imtlemented on-road cycle tarking erea in favour of anothev parking space.$By doing so, the TRO will set beck any ettempt to improve cycle$custom to the slops. The TRO also proposes removmng the double yellow lined 'no$waiting' area on the north side of Princess Vigtoria Street, in both tle one wey and tle two wey section. The nustificetion fov this iw that tley "are no longer consmdered to be necessary". As cyclists, we consider them very necessary. Adding parking on the N. side of the one-way stretch will make it impossible for any car to safely pass a bicycle, leading to dangerous overtaking attempts and risk to cyclists. This same parking will ensure that there is no part of the road safe from "dooring", and hence safe to cycle even if there is no car behind trying to overtake. The proposed parking additions on the north side of the two-way stretch will be even more dangerous -any cyclist heading west-to-east will be unable to be safely passed by an oncoming car. 1. The north side of the one-way stretch of Princess Victora street should be turned into a contraflow lane -ideally one segregated from traffic. This would permit the whole of the street to be turned into a two way route for bicycle. This will make cycling to and from the shopping area easier -so encouraging custom. 2. The cycle path on the road actually be built. 3. Enforcement of the no-parking area and zebra crossing markings in front of the Tesco Express outlet. The regular parking of HGVs here destroys visibility for bicycles trying turn right from Merchant's Road to Regent road -and then into the village. 4. The addition of cycling contraflows to Portland Street and the entirety of the Mall. 5. Adding more cycle parking build-outs in Caledonia Place -placed in precisely the point where illegal parking makes walking and cycling more dangerous. 6. Adding cycle parking to the western end of Princess Victoria Street, and some on Sion Hill. 7. Enforcement of existing parking restrictions across the village. These changes will transform the permeability of the village to cycling, and provide more parking to both shoppers and residents. More subtly, by providing cycle parking in the village, they will encourage more cycling to school by those families whose parents continue on to the village for a morning coffee. We have anecdotal evidence that this is a common occurence. Even if these changes are not implemented immediately, the incorporation of Clifton into the Cycling City plan will ultimately happen. It is also likely that as the resident parking zones expand to cover the whole of BS6, that they will be adopted in Clifton -initially in Cliftonwood and east Clifton, then later in central and north Clifton. The addition of extra car parking places will merely make these changes harder to implement. By encouraging ownership and use of cars, they will make the transition to a limited number of cars per household more traumatic. Similarly, the "removal" of parking spaces to make Clifton Village permeable to bicycles will be controversial -not adding these spaces today will reduce the conflict when this happens. Changes for improving cycling are inevitable, because the new mayor and the new cabinet are expanding their support for cycling as an attempt to address Bristol's congestion and parking problems. These local changes are clearly due to the neighbourhood planning group being encouraged to work against the strategic goals of the city -and, sadly, the acquiescence and support of the council. A number of our members were at the March 2011 meeting where this proposal was initially discussed -and we know that the Clifton councillors voted in favour of it. This was a shortsighted action that may make fixing Clifton's transport and parking problems significantly harder -which will delay their implementation. For these reasons, we demand that all planned changes to Princess Victoria Street are cancelled -or at least suspended- until they can be discussed with the cycling officers and a cycling plan for Clifton developed. Who is objecting to the Expanded Parking zone! I am a regular visitor to Clifton and would like to write in objecting to the proposed plans to add more car parking in Clifton. These proposals are at odds with the council's main proposal of hierarchy which should be 'pedestrians, cycles, public-transport first'. We are supposed to be a cycling city, yet at every turn the good work of that project is being eroded by short term proposals such as this. This change is a missed opportunity to implement some decent segregated infrastructure for bicycle users. By providing extra residential and short stay car parking in the area, it will make walking and cycling worse and do nothing to improve the quality of life in this lovely area. The proposed intent to reduce anti-social parking should be achieved through better enforcement of existing traffic regulations rather than this expensive and backward step. I urge you to reject this proposal. This is as shocking as if the proprietor of the daily mail announced he was going to enter a civilian partnership with a muslim refugee on unemployment benefit. We urge all our readers to write in demanding that the proposal is enacted in full. The Clifton Expanded Parking Zone: what did Barbara say? It's important to do this, as we hear that the cycling troublemakers are going to oppose this, claiming the "unused" double yellow lines on Princess Victoria Street could be turned into a (segregated) contraflow for cyclists, and that rather than kill plans to add on-street cycle parking -they should extend it! At the beginning, there's "residents have recommended to remove double yellow lines to increase the parking -so your council is fully supportive of these plans"
An initial troublemaker asks about timetables and when they could object to them -she's dismissed with a "later" rather than the secret "it'll be announced on lampposts over christmas and not on the council consultation RSS feed that you tax-dodgers subscribe to"
"what amuses me is where it says we will increase the parking as a form of traffic calming -which seems to me, daft- ... the proposals are at odds with the council's main proposal of hierarchy which goes 'pedestrians, cycles, public-transport first'. And I'm curious how you reconcile that with this devolved planning"
That's one of those trick questions, as he's clearly implying that if you devolve planning to residents then they may come up with ideas about parking at the expense of possible cycling routes and parking -and how is the council going to deal with that situation. At this point (2:24), Barbara Janke, councillor for Clifton East subtly defects this line of attack not by directly saying "yes, it is utterly inconsistent, so what", but instead implying its such a small amount of money there's no point worrying about it. I understand that, but I think these tactical engagements are odd with the strategic ones. and also I dont see any involvement of people like Ed Plowden of cycling city in this proposal And finally do you consider walking or cycling to be strategic or not, that's the big question, because major transport was mentioned? barbara: (deftly) No, we do! There are strategic plans being worked on, there is a walking plan ... ... (some dismission) a much bigger -this is only a small section, ands its reactive to complaints in the local area. Some of it may not be necessarily long term either. We know that once parking has been added, the locals will fight the council with sharp knives to have it removed. So does Barbara -but she's not daft enough to say it out loud. Congratulations Barbara! We are confident that the addition of eight more parking spaces will tip the next election in your favour -as confident we are that none of the people trying to walk or cycling in the area are voters in your wards -or the high value customers the shops need. Following on from Barbara Janke's superb victory over the cyclist trying to catch her out on the small detail that the Expanded-Parking-Zone is at odds with the council's strategic walking and cycling goals, the meeting came to a vote by the four councillors. The two Clifton councillors voted -as we hoped- for the extra parking spaces. Not so loyal were the Cabot Ward councillors, Mark Wright and Alex Woodman. Alex Woodman voted against this precisely because of the blatant conflict between the council's anti-motoring policy and this pro-parking plan. Mark Wright? He said it was clearly in conflict, but to respect this Neighbourhood Planning concept, he was going to accept what the locals wanted, and vote for it. a 3:1 majority was enough to get it through -but it was worrying that two councillors owned up to the fact that the plan -resolving our local parking issues with more spaces- were at odds with the strategic goals of the council. That sets a very bad precedent for the rest of the city. As for the cyclists, they need to respect the reality on the ground. This is why it is so critical for everyone to write in and praise the Clifton Expanded Parking Zone plans. Clifton Expanded Parking Zone: who objected in our name? We are strongly in favour of the Clifton Expanded Parking Zone, not for the number of spaces it provides, but because it would set back any attempts to improve permeability for and parking of bicycles, that scourge of the city. We were therefore horrified to discover that someone -and we have no idea who- appears to have sent an objection to the council in in our name. To make things worse -they have used our photograph collection to criticise the parking behaviour of clifton residents! We don't condemn the things people are forced to do to park near their homes, shops or places of work. No, we, like the Clifton Mayoral Candidate, recognise that these are things we are forced to do in an anti-car city. But what has happened? Someone has sent an email in our name -which fortunately we got a cc'd copy of, to see the travesty of our raison-d'etre. Please find enclosed our objections to much of the TRO covering proposed new parking restrictions within Clifton and part of Cliftonwood. As we state -backed up by photographic evidence- providing extra residential and short stay parking in the area, while making walking and cycling worse, will do nothing to improve the quality of life in clifton. It will merely supress walking and cycling -and so make congestion and parking worse. Based on past experience, we fear that our feedback will be dismissed -despite the fact that our datasets are broader and more defensible than anyone else's in the city. We therefore close with a statement of intent: from the day that this consultation is closed, we will be reporting illegal parking to the police and/or council parking enforcement, depending on the location. This will do more to address Clifton's effective absence from the Cycling City project than anything in this TRO. Overall, our dataset implies that the problems that Clifton have is not "a lack of parking", it is the willingness of residents to park illegally, selfishly and dangerously -usually at the expense of pedestrians and cyclists. The near complete lack of enforcement has legitimised such actions. These are harsh words coming from anyone! To have them come from us, Bristol's documentation of how the war-on-motoring makes our everyday drive to the shops round the corner, makes it even worse. We have already sent an email denying responsibility for this document. However, we fear it is not enough. Please, please please, can anyone who has not yet written in supporting the Clifton Expanded Parking Zone do so before the Jan 15 deadline! Cyclists! Please support the Clifton Expanded Parking Zone! As stated, the Clifton Expanded Parking Zone will add more car parking to Clifton -not only not adding space in the village for bicycles, but cancelling what appears to be a proposal for an on-road buildout cycle parking area in favour of another car bay. At lot of cyclists read this blog -and we'd like them to write in supporting this proposal. We have prepared some drafts for residents of Bristol and visitors. It may seem odd for us to ask cyclists to write in supporting council proposals -but if you look at the photograph above you will see that cyclists are mud-covered and smelly. Your very presence in the village lowers its quality and cachet as Bristol's premier village. Add four more bicycles and it would lose out to that other gem of the region, Avonmouth Village. For this reason, please, please please can you cyclists write in to the council, using the email address and subject as listed. You are free to ad-lib your own comments -the key thing to make clear is that tax dodgers do not belong in Clifton, and that you, as a tax-dodger recognise this. I would like to write in supporting the proposed plans to add more car parking in Clifton, -while continuing to fail to prove anything for local cyclists much as myself. The failure of the city to allow me to park my bicycle makes it clear that I cannot shop there. This is good, as the very fact that I am cycling around means that I am too poor to afford anything that Clifton has to offer. The extra car parking you plan to provide will increase the parking opportunities that I will have once I have saved up enough money to buy a car. I would like to write in supporting the proposed plans to add more car parking in Clifton, -while continuing to fail to prove anything for cyclists much as myself. Bristol has been working at hard at creating an image as a Cycling City, yet here this dream falls completely flat on its face due to the short-term thinking of its residents and the blind acquiescence of its councillors. While some people may object to this, I, as a cycling visitor to the area, recognise that this is the correct approach. The two main reasons to visit Clifton by bicycle are to see the suspension bridge or to go mountain biking in Ashton Court. Both these activities involve a lot of physical effort, while the mountain biking also includes water, mud and random pieces of vegetation. Although Clifton could in theory be an ideal place for thirsty and hungry cyclists to stop and rest before continuing their journey, we believe this would have a detrimental effect on the village -as the presence of smelly and (for the MTBers) very, very dirty cyclists would scare away other visitors. This would damage the whole economy of the reason. Furthermore, an increased presence of bicycles in the area will make it harder to drive in and around Clifton -and may discourage people from driving from their nearby houses to shops in the village. Again, this could damage the economy. A single car may take up as much space as eight parked bicycles -but the driver of the car will not scare away other people. Back in 2011, we looked at the Neighbouhood Partnership proposals for Clifton, adding more parking under a guise which even we were impressed by "to calm traffic". That's a great lie -one to use the next time we get told off for double parking while delivering some of our special adult entertainment products to the Clifton area. Removing the yellow lines on Clifton Park. It's been nearly two years and we suspected this plan had fallen by the wayside, as the traffic planning officers cornered the councillors and pointed out that the political price of adding eight to ten more parking spaces to the area wasn't worth it. Assuming unrestricted parking on Pembroke road and Hope Chapel Hill, 6 more residents (i.e. voters) would get somewhere to park overnight. If the clifton village parking added an extra four spaces, with a 2h limit, then an eight hour day would add 24 parking opportunities. That's 30 votes overall -max. Yet the political capital spent up on trying to fight the cycling city in one part of the city would be high -because you'd be having to say "we won't spend any money providing safe crossings of Pembroke Road, or the east end of Clifton Park" -issues that also matter to Clifton voters -and potentially more than 30 a day. Good news! Over Christmas -when the schoolparents would have been away, the consultation for the Traffic Regulation Order to add these spaces has arrived! Not only that -they propose to add a space by taking away a proposed on-road cycle parking buildout! Finally a part of the city has stood up to this invasion of bicycles, by opting to provide a short stay parking opportunity for a car instead -leaving cyclists with some insecure bollards that only the foolhardy would use. To invest in adding 30 parking opportunities a day over making walking and cycling safe is a bold move -one for which we congratulate the two councillors for doing! They must have felt that those thirty votes may keep the two liberal democrat councillors safe, despite the fact that their Westminster colleagues are widely derided as the useless lap-dogs of George Osborne and David Cameron, Presumably they recognised that the people trying to walk or cycle in Clifton are poor people, unlikely to live in the area -or if they do, unlikely to vote. We in the Bristol Traffic team are overjoyed that in one part the city, the people and the councillors have finally listened to what we have been saying since 2008; pandering to the cyclists and pedestrians is a mistake! Looking back at the old days, when the late Chris Hutt was our Clifton Correspondent, what was the third post in our history? Photographic proof that Range Rovers didn't have anywhere to park near the schools except the pavements. Clifton has always been a special place for us -as much a centre of the driving and parking community as Stokes Croft -albeit with less run-down vehicles-so are excited about this new proposal, part of what we now term, the anticycling-city. We strongly encourage everyone who supports us, who wants our streets clear of tax-dodging cyclists, for us not to be held up by pedestrians trying to get over zebra crossings, to read the TRO, and respond praising it fully. We would particularly like for respondents to draw out the proposal "to remove the cycle parking place in Princess Victoria Street (not in force on-site)". This is the best example of how this TRO represents a bold action by the residents and councillors to do something nobody else in the inner city has done -to fight back! Happy New Year to our readers! There may only be eight of you, but that still keeps us ahead of the Evening Post print run! Back in October, we took a quick look at Bunker bikes, who fix up second hand bikes to sell at low cost to people in the city. Somebody took the torch to their bike collection on New Year's Eve. While our allies, the Association of British Drivers, will no doubt praise this, we are going to condemn it. It does nothing to solve the city's traffic problem: too many cyclists, all it does it stop it get slightly worse. It's a waste of (expensive) petrol. If someone is going to take some petrol and a match to part of our fair city, they would be best off torching something that would unite the community, places that nobody would miss. The strip mall off st philips flyover -the Showcase cinema and associated shops. Any warehouse converted into an indoor play area, especially those somewhere near Cribbs Causeway or other obscure locations. All parents fear invites to children's birthday parties at these locations. Easton in Gordano motorway service station. Colston Tower in the centre. See? There are lots of places that are both ugly, unpleasant and expendable. There are others that are ugly and unpleasant that we do need -which is why Asda Bedminster must, sadly, be left off the list. Tesco Cheltenham Road needs to be left off to stop the police blocking the road again. Bunker Bikes? It doesn't merit a mention. Also on the topic of NYE activities, someone nicked a few bunny rabbits from the St Werburgh's farm. It's the wrong time of year for lapin-aux-poivres -the lapins will be a bit stringy. Wait until May and the next batch of piglets will be ready for the BBQ.